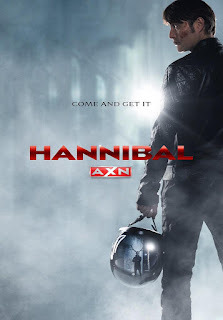 Around the middle of this deliciously superb return to one of TV greatest current accomplishments, Hannibal tells Bedelia "I've taken off my person suit". It's difficult to distinguish whether he is referring to Hannibal as a person or Hannibal as a television production. Whilst Bryan Fuller's horror series began as a crime-of-the-week thriller which only truly began taking risks towards the end of the first season, the show's second outing flourished as a production unlike any other currently on air. Hannibal was loaded with stunning imagery, using visual metaphors to further dissect the psychological state and motivations of each of its characters. The show's soundtrack also descended into wonderful madness; crashing, irregular drumbeats would cascade over even the most basic of sequences. If season two was Hannibal beginning to break away from convention, then by now it has left all resemblance of normality behind. As Hannibal himself said, he's taken off his person suit. Antipasto doesn't kick off where one might expect. Whereas it would be perfectly acceptable to return to the immediate aftermath of the bloodbath of last season's finale Mizumono (which I discuss briefly at the end of this article), Hannibal here jumps a few months into the future, as well as both years and months into the past. Antipasto is an unusual season opener for a number of reasons, primarily that it only features two of the names that make up the title sequence. Will Graham, Alana Bloom and Jack Crawford are all absent for this premiere which rests solely on the shoulders of Hannibal Lecter and Bedelia Du Maurier. Mads Mikkelsen has been consistently excellent since this show premiered over two years ago, but Gillian Anderson has now been awarded a regular position on the show, and she steps up to the standard of those around her. She traces Bedelia's character with undertones of fear and terror despite her willingness (or unwillingness) to be where she is with Hannibal. The development of their relationship could be the most interesting thing the show does this season, although it's difficult to judge when Will Graham is currently out of the equation. After being questioned by him early in the episode, Bedelia tells Hannibal "I still believe I'm in conscious control of my actions. Given your history, that's a good day", yet while he murders Anthony at the episode's close, Hannibal questions whether Bedelia is participating or merely observing. Bedelia tells him she is observing, yet Hannibal corrects her, believing her to be participating in his actions. Hannibal is already having a strong influence on how Bedelia acts and how she thinks and how she feels, I can only question how long it will be until she is an even larger piece on Hannibal's chess board. And yet, as made aware first via flashback and then via Anthony, Hannibal is feeding her the food that the Romans would feed their livestock to improve the quality of their meat. Whilst Bedelia has decided she is refraining from "eating anything with a central nervous system", it appears Hannibal hasn't quite given up his own unusual delicacies just yet. Antipasto is a stunning season premiere that, while not kicking the series off with a bang like last year's Kaiseki did, slowly and intricately allows the pieces to fall into place using it's wildly non-linear structure and fluctuating visual filters and aspect ratios. It will never cease baffling me that Hannibal is shown in the U.S on a network channel rather than the more niche cable outputs; this is, after all, one of the most conceptually, thematically and artistically unusual shows on air. It's also nice to see that Hannibal hasn't lost its touch for breathtaking visuals; Bedelia's bathtub sequence was beautifully executed, reaffirming water as a key placeholder in the show's terrific visual metaphors. Next week Hannibal comes back with an episode entitled Primavera, and many of the advance reviews released before this series began labelled this as the one in which the series picks up. Antipasto does, after all, translate to English as 'appetizer'. If this is just course one, then bring on the rest of the meal. Hannibal's face molding with the screen behind him was a brilliantly terrifying moment, further reminding us of how smart this show can be with its cinematography. We now know more of the fate of Abel Gideon, who seems to be making a habit of sitting at a dinner table garnished with his own body meat. Those snails looked great in black and white. "This isn't cannibalism. It's only cannibalism if we're equals".